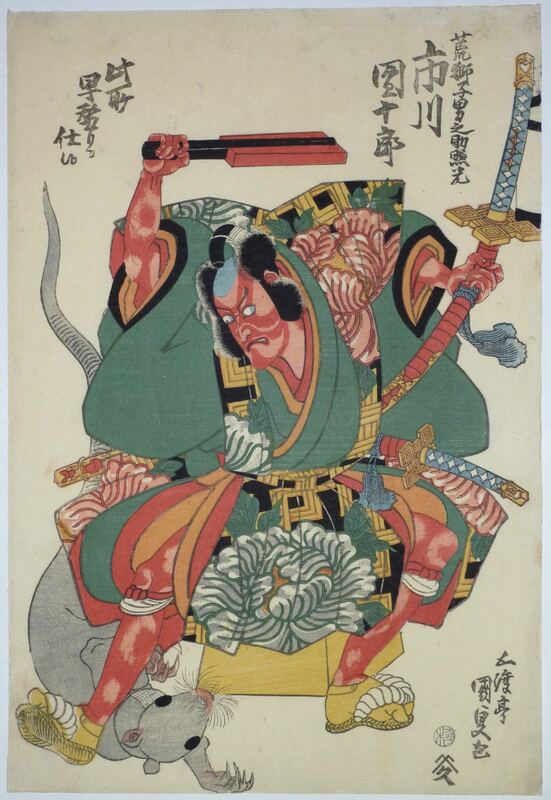 A lively design showing Ichikawa Danjuro VII in the role of the loyal warrior Arajishi Otokonosuke Terumitsu fighting a giant rat in the cellar beneath the women’s quarters of the Ashikaga Palace. This scene, Yukashita no Ba, is from the play Date kurabe okuni Kabuki performed at the Kawarasaki-za Theatre, 3/1829. Shortly afterwards, the rat escapes down a hole in the hanamichi pathway, only to re-emerge in a cloud of smoke as the arch-villain and master of the black arts, Nikki Danjo. Published by Eikyudo (Yamamoto Kyubei) 1829. Fine impression, colour and condition on an extra large sheet of hosho. Signed Gototei Kunisada ga.